Editor’s Note: During each of the five days leading up to this year’s 52nd Goodyear Knoxville Nationals, Tony Stewart Racing will revisit each of Donny Schatz’s five Knoxville Nationals triumphs in advance of Sprint Car Racing’s biggest event, which kicks off Wednesday, Aug. 8. 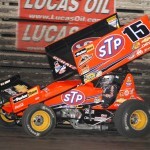 After his streak of winning four consecutive Knoxville Nationals was stopped in the 50th annual event, Donny Schatz was ready to begin another streak. The four-time Nationals champion started his “Drive for Five” in solid fashion by qualifying second-best during the opening night of the Nationals. He brought the crowd to their feet with a thrilling drive from eighth to first in the second heat, which included him taking the lead on the backstretch during the final lap. His qualifying night gremlins of recent years continued in the 25-lap A-Main. After starting seventh, he was working his way into the top three when his motor blew on lap seven. He finished 24th, but the points for qualifying and his heat win earned him the 13th-starting spot for Saturday’s 50-lap A-Main. Schatz didn’t waste any time in his run to the front passing cars in every corner. He reached the top-five by lap seven and went three wide to take the lead on lap 15. He raced away from the field until the mandatory stop closed the gap. Daryn Pittman and Schatz exchanged the lead just after the break, but once again Schatz would pull away. In the end, it was victory number for five for Schatz and he took nearly 1,100 fans with him to victory lane as part of TSR’s Sign ‘N Ride program. Names of all of those fans were one the car when it rolled in Knoxville’s most desirable spot. 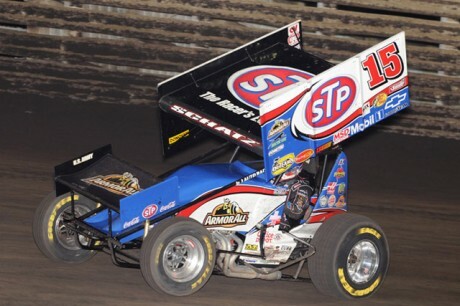 Schatz will compete in his 19th Nationals and wearing a special blue Simpson racesuit. Through a joint promotion between Tony Stewart Racing and STP one lucky fan will win the racesuit. Entrants will only be accepted on-site beginning, Wednesday, Aug. 8 at 12 noon, through Saturday, Aug. 11 at 3 p.m. Schatz will make his first laps in the suit during the opening night of the Knoxville Nationals on Aug. 8.